How much does a receiver who gets deep running a pass route as fast as any man in the NFL worth to the Philadelphia Eagles offense? DeSean Jackson thinks the answer is going to come in the form of wins, and many of them. Truth is, Jackson never wanted to leave. But he had no choice in the matter once former head coach Chip Kelly decided to dismantle the Eagles after the 2013 season. Jackson was released,and running back LeSean McCoy was traded and the Eagles were never again the same. Kelly wanted things done his way, so Jackson launched his second NFL life, playing for three seasons in Washington and two in Tampa. He wasn’t a whole lot different than the Jackson who lined up and terrorized defenses for six seasons in Philadelphia. Jackson’s brand is speed, live and on display, and if you have a cornerback who can turn and run with Jackson, well, get him in front of the line. The league hasn’t been able to keep up with Jackson since the Eagles made him a second-round draft pick from California in 2008. Four times he’s led the NFL in yards per reception and he’s got an NFL-most 24 touchdown receptions of 60-plus yards in his career and had a total of 29 TD catches of 50-plus yards, trailing only Hall of Famer Jerry Rice’s 36. The Eagles made acquiring Jackson a priority in this offseason, feeling like his jolt of speed would add a legitimate vertical threat in the passing game. Quarterback Carson Wentz should benefit tremendously, both as he airs it out and lets Jackson catch up to his deep passes with his speed, and in the intermediate passing game with the likes of Alshon Jeffery, Nelson Agholor, Zach Ertz and Dallas Goedert running routes. The offseason work isn’t done yet on the offensive side of the ball – for all of the emotion and outrage, there are options and still plenty of time to add to the running back room and bolster depth along the offensive line. Jackson is the prize early in free agency, along with the addition of impact defensive tackle Malik Jackson, who should be a great fit lining up next to Fletcher Cox. 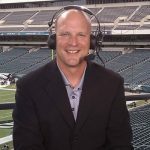 Retaining end Brandon Graham was a coup and the Eagles also made sure to answer their offensive line questions by working out a new deal with left tackle Jason Peters for 2019 and giving new deals to center Jason Kelce and guard Isaac Seumalo and they kept their best cornerback, Ronald Darby, on the roster with a one-year contract for 2019. What’s next? This is a piece-by-piece process and the Eagles think they’ve added substantial ones in the Jackson Two. When we last saw DeSean Jackson, he was a brash, flashy veteran in the prime of his career. Now he’s entering his 12th NFL season and he’s wiser, knowing what’s at stake.